Still lots of Dragonflies in my yard and nearby but as they all mature and want to mate, there are a lot more battles that do damage between the males. Here is one warrior waiting for his chance to find a gal dragonfly. Nice catch, he looks like a sturdy fellow. He was abusing a slightly smaller immature male in between photos! He has redundant wings which should be quite handy . He's got that kind of rugged good looks...the strong , silent type...hope he find the girl of his dreams. Good pix and thanks for the info. I did not know that male dragonflies 'duked' it out with others of their kind. 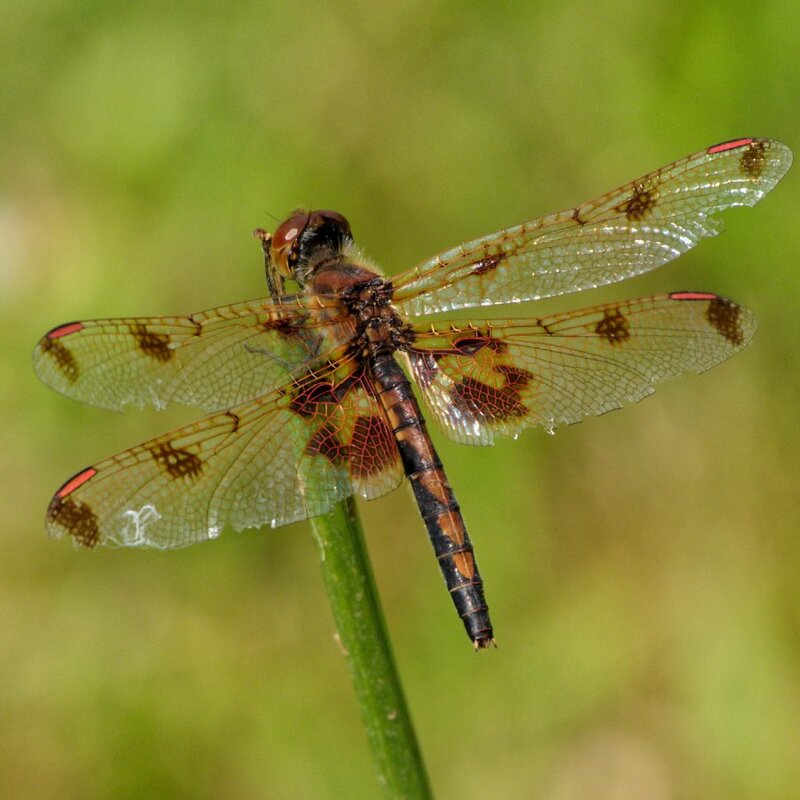 There is a bias in gender of dragonflies, there are many more males than females so the females will often live away from the water where they changed from larvae into flyers due to heavy harassment from all the males trying to mate with them before they are ready. Some species have the male stay a more yellow color until fully mature when they turn red, to avoid battles that could injure or kill them before full maturity. That and the fact that once they have a perch or two, they like to go back to the same spots even when us photographers bug them. I've had an interest in dragonflies, ever since I learned that they eat mosquitoes. A lot of years we get a sizeable number of mosquitoes hatching up here and I'm always pleased to see dragonflies. I've often wondered if the inventor of the helicopter got inspired by watching dragonflies hover and fly about. Thx for the additional info., which was new to me. Thanks for the comment, I like them since being in Maine by a lake and river, and with lots of boggy areas nearby, anything that eats mosquitos and their larva is a pal of mine! Dragonflies eat mosquitoes? Another good reason to like them. Great shot!